Based on the ACMG/AMP 2015 guidelines, the criteria fall into two sets: pathogenic/likely pathogenic (P/LP) and benign/likely benign (B/LB).There are a total of 28 criteria: for the P/LP criterion, there are 16 criteria as very strong (PVS1), strong (PS1-4); moderate (PM1-6), or supporting (PP1-5); for the B/LB criterion, there are 12 criteria as stand-alone (BA1), strong (BS1-4), or supporting (BP1-7). The Classify System is combing the rules from the Evidence System.The execution of our InterVar mainly consists of two major steps: 1) automatically interpretation by 28 criteria; and 2) manual adjustment by users to re-interpret the clinical significance. InterVar is a bioinformatics software tool for clinical interpretation of genetic variants by the ACMG/AMP 2015 guideline. 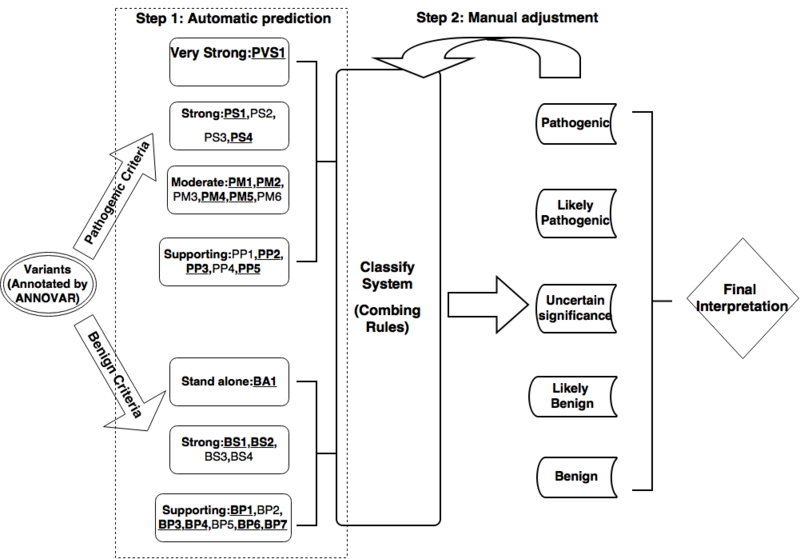 The input to InterVar is an annotated file generated from ANNOVAR, while the output of InterVar is the classification of variants into 'Benign', 'Likely benign', 'Uncertain significance', 'Likely pathogenic' and 'Pathogenic', together with detailed evidence code. The American College of Medical Genetics and Genomics (ACMG) and the Association for Molecular Pathology (AMP) published in 2015 the updated standards and guidelines for the clinical interpretation of sequence variants with respect to human diseases, based on 28 criteria. However, variability between individual interpreters may be extensive due to reasons such as the different understanding of these guidelines and the lack of standard algorithms to implement these guidelines, yet computational tools for semi-automated variant interpretation are not available. 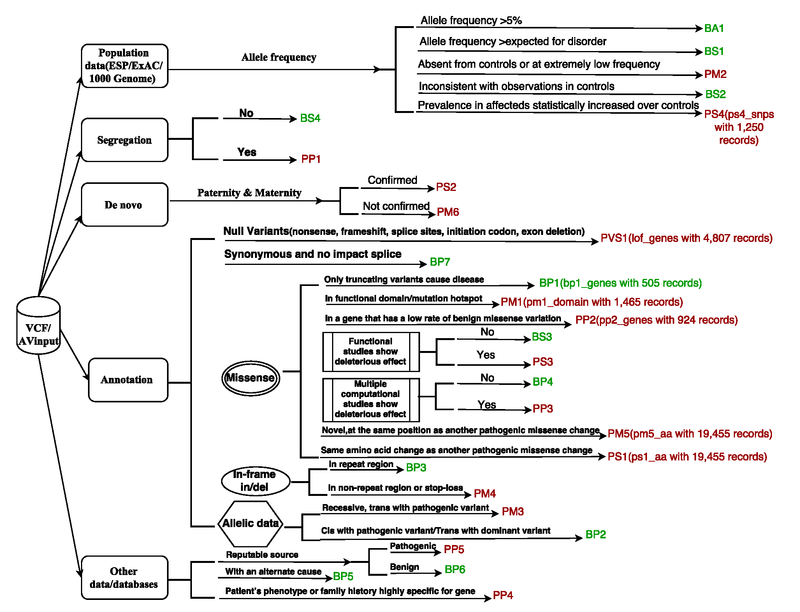 To address these problems, we proposed a suite of methods to implement these criteria, and developed a tool called InterVar to facilitate human reviewers to interpret the clinical significance of variants. InterVar can take a pre-annotated file or a VCF file as input, and generate automated interpretation on 18 criteria. Furthermore, we developed a companion web server wInterVar to enable user-friendly variants interpretation with an automated interpretation step and a manual adjustment step. These tools are especially useful to address severe congenital or very early onset developmental disorders with high penetrance. Using results from a few published sequencing studies, we demonstrated the utility of InterVar in significantly reducing the time to interpret clinical significance of sequence variants. Figure 3. An illustration of wInterVar. 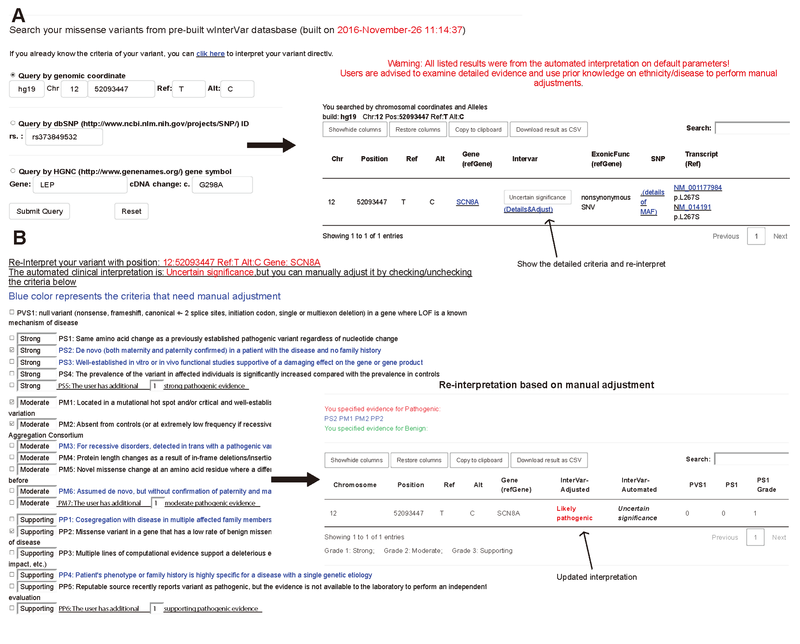 (A) automatic interpretation of genetic variants, which can be entered by several means (B) once users click "Adjust", the full list of criteria is shown for manual adjustment, to derive the final results.